"One of our principal projects is the restoration, to flying condition, of an original BE.2f - serial number A1325." This project had previously been worked on by several different organisations both in the UK and in New Zealand. Initially this project was thought to be a BE2e and prior to arriving in our workshop quite a lot of work had been carried out under this misconception. From our library of drawings and photographs we deduced that it was in fact a BE2f , which is outwardly very similar to a BE2e but with the major difference that the fuselage is from a BE2c. The main indicators of this, which can be backed up with drawings are- the rear decking of the fuselage is ply covered; this was replaced with wire bracing in the BE2d and BE2e and even in some later BE2c’s, the main vertical strut in the fuselage just in front of the pilots seat is made from Ash- this was a steel tube in the BE2e. The lower main longitudinal members are shaped differently in the two models- the original ones that came with the project are of the BE2c variety. And, finally, there are a myriad of minor differences in the bracketry, that, while individually may not be to persuasive, when they are grouped together confirm that this was indeed definitely a BE2c fuselage. Armed with this information we set about undoing some of the painstaking and delicate work that the earlier organisations had carried out in the belief that they were working on a BE2e fuselage. It was believed to be part of a batch of BE.2's delivered to Norway by the RFC in 1917. 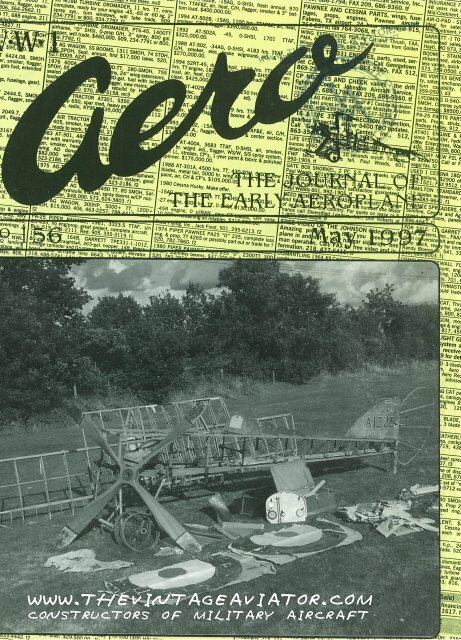 It was eventually donated to the Mosquito Museum in the UK (the BE.2 being an early DeHavilland design), and after several years it found it's way into private ownership - and put up for sale in WW1 Aero magazine. It was acquired by the NZ based 1914-18 Aviation Heritage Trust over 10 years ago. The fuselage was in great condition, with a lot of original timber in airworthy standard. A set of reproduction wings had been made for it in the UK (not entirely accurately as it turned out), and it arrived with an original RAF 1a engine in very poor condition. The engine problem slowed the project down for a while, but during that time full advantage has been taken of the uncovered original airframe. The Vintage Aviator has made several reproductions, with appropriate modifications to reproduce a range of different BE.2 models. With reproduction RAF 1a engines now well underway, work began in earnest to return A1325 to the air. We replaced the lower longitudinal members with the original ones that had previously been removed. And then we removed the BE2e fuel tanks, front seat frames, cowl and carlin arrangement, front wing spar carry-through tube and engine bearer braces. We then fitted new engine bearer braces, carry-through tube (with fuel tank mounting brackets attached), carlins and cowl and a BE2c main tank- all of which have been made to the original drawings. The passenger’s seat is now bolted directly onto the top of the main fuel tank. Most of the work on this plane has been carried out in conjunction with the reproduction Be2f and the early type and late type BE2c’s that we are building. Throughout these projects it has been easy to see where the confusion lay when these planes were being manufactured originally and why they re-designated the BE2c and BE2d fuselage fitted with BE2e wings as the BE2f and BE2g respectively. At the time of writing the cowling with windscreens, windows and cockpit combings are being fitted and the controls are being rigged up. The top wings are getting their king posts and bracing wires fitted ready for a trial fit prior to covering. The service tank and engine cowls are also under construction, as is the RAF1a engine. The task of restoring and manufacturing these planes is very time consuming and labour intensive but the prospect of seeing these planes once again take to the air is terrific motivation and will be a great reward for the effort put in by ourselves and many others involved.